First off, it’s not a slavery reference. Go somewhere else trolls. So, the heroic martyrs of Obama’s Occupy movement would save us from the evil banker oligarchs. They decry the economic influence these businessmen have. They rant about the political power wielded by Wall Street. The least radical solution proffered by the protesters and their Democrat patrons is that we divest ourselves of the monolithic financial institutions of Wall Street and “spread the wealth”. (even though the Occupy leaders do business with them) Well, as I have said before, maybe Wall Street isn’t what they should be occupying. Judge Andrew Napolitano (Fox News contributor if you are keeping score) posted an interesting graphic on Facebook detailing where Wall Street influence seems quite prevalent. Despite their public vilification of financial institutions and their managers, Obama’s administration seems quite comfortable having them in their midst. 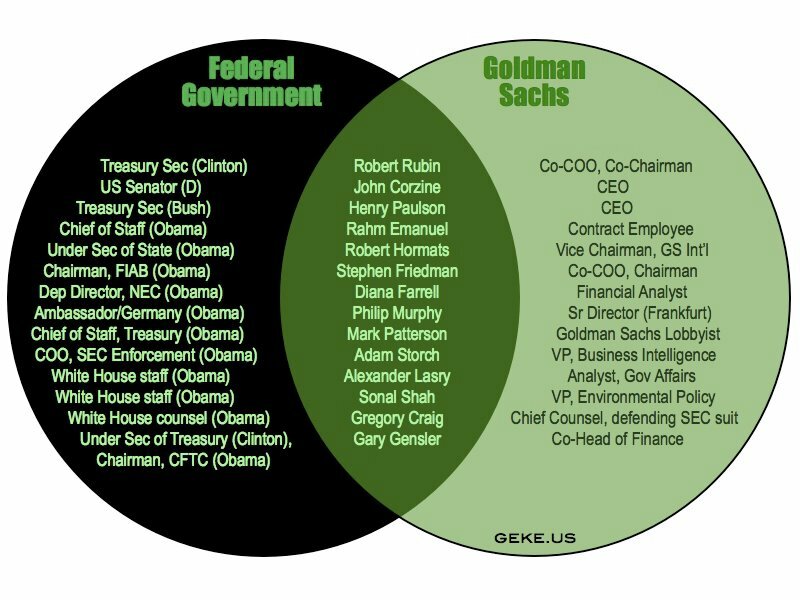 The Executive Branch is fairly infested by Goldman Sachs personnel. As part of the bailout of AIG, Goldman Sachs received over $12 billion in taxpayer funds; ostensibly to prop up the weakened financial sector and failing American economy. Almost half of the money then flowed to more than 30 other organizations, many of which were overseas. To add insult to injury, Goldman Sachs announced this year that it would lay off over 1000 Americans as it shifts some operations to Singapore. The savings will be at least a billion dollars next year. This is after the company reported a $2.3 billion profit in just the first three-quarters of this year. If you have read here for any time at all, you know that I am a vocal champion of free market capitalism. Hearing me, the occupiers would shout back that the Goldman Sachs story illustrates why the capitalist system is a failure and must be destroyed. But, I argue that this is NOT capitalism. This is cronyism bordering on socialism. The revolving door of corporate insiders through policy making and regulatory positions enables a pattern of systematic favoritism. Add to that the tremendous influence bought by copious campaign contributions by Goldman Sachs and other big financial firms. With these forces at play, the government finds itself into a position where it can and does choose which businesses will fail or succeed. This is what is broken. Proposals have been made for years on how to limit the influence of big money donors in politics. Short of a total revamp of the tax code that eliminates the fiction of corporate income taxes, most other ideas are stopgaps. But, there is one idea that in the face of our current budget and debt limit negotiations has piqued my interest. Professor Glen Reynolds (The Instapundit) has long proposed a 50% surtax on anything earned for 5 years after leaving federal, non-military service. Check it out here. As things are now, I stand by the sentiment in the title of this rant. Who owns Obama and his administration? Look below and see. This entry was posted in Barack Obama, Economy, Occupy Wall Street, Politics and tagged bailouts, Barack Hussein Obama, corruption, economy, Obama, Occupy Wall Street, politics, Wall Street. Bookmark the permalink. Austrian school economist Hans-Hermann Hoppe as convincingly argued in his book A Theory of Socialism & Capitalism that there are only two possible archetypes in economic affairs: socialism and capitalism. All systems are combinations of those two types. The capitalist model is defined as the pure protection of private property, free association, and exchange – no exceptions. All deviations from that ideal are species of socialism, with public ownership and interference with trade. Within the structure of socialism, one can distinguish between the left and right version. “Conservative” socialism favors high regulation, behavioral controls, protectionism, and nationalism. The “liberal” version tends more toward outright public ownership and redistribution. Crony capitalism is, by definition, simply a hybrid form of socialism.